KUALA LUMPUR: Deutsche Bank is looking to derive a fifth of its revenue from the Asia-Pacific (Apac) region over the next few years and eyeing further expansion in Australia and China, says its chief executive officer (CEO) for Apac Werner Steinmueller. Last year, the Apac region accounted for close to 14% of the global financial institution’s net revenue of €30 billion. Headquartered in Frankfurt, Deutsche Bank is Germany’s largest lender. “My aim is to grow it more like where we are in the Americas, which is 25% to 30%, but it will take time. My next goal is to go for 20% for Apac, but in the next few years,” Steinmueller told The Edge Financial Daily in a recent interview here. Deutsche Bank sees Apac as a region of growing importance for it and plans to enrich its existing offerings there, he said. “For example, we are looking into additional investments in our Australian global transaction banking business on the cash management side. “And, we want to invest in asset management in the region, as we see significant opportunities in this area, particularly in markets like China, where we are seeing increased liberalisation,” he said. Steinmueller has the distinction of being the first-ever Deutsche Bank board member to serve out of Asia. Last July, Deutsche Bank made him a management board member and moved him to Hong Kong to take on his current role, in what was seen as a telling sign of the bank’s intent to increase its focus on the region. Steinmueller was previously Deutsche Bank’s head of global transaction banking. “[My move here] is a direct reflection of the fact that Deutsche Bank views success in this region as critical to our global business. And my job is pretty clear — to grow the business in alignment with regional gross domestic product growth, faster than the rest of the world. This means, looking at our opportunities in the market, getting the opportunities, and also allocating the resources in our region,” he said. Deutsche Bank’s roots in Apac go back to 1872 when it opened its first branch in Shanghai, China. Today, it is in 15 markets and employs some 19,000 staff. This year marked its 50th year of operations in Malaysia. Apac’s stronger economic growth in recent years relative to other regions has proven to be a strong draw for global banks. “When you look at the three major regions in the world, with the US with about 2.5%-3% economic growth momentum, Europe with 2.2% and Asia with 5%, I think this is a clear message — Asia is growing at an impressive rate. “There’re two giants here with exceptionally high growth rates — 7% for India and 6.7% for China — and so, there is significant growth that is being driven from this region. China is now already the second biggest economy in the world, and maybe, in 20 to 30 years, it will be the biggest economy, which means a shift of power from the West to the East. So, I think, if you are not present and focused in this region, it’s a big mistake,” he said. Deutsche Bank focuses on both commercial and investment banking in the region. In particular, Deutsche Bank has a strong sub-custody business in the region. In Malaysia, the group’s revenue is equally split between commercial and investment banking, said Deutsche Bank’s country manager for Malaysia Datuk Yusof Annuar Yaacob. The bank’s businesses here range from debt capital raising to cash management, trade finance, foreign exchange (forex), custody and fund administration. Its clients are mainly multinational companies and large, local corporates, including government-linked investment companies such as Khazanah Nasional Bhd. Deutsche Bank’s asset size in Malaysia has come down slightly in the last few years due to a shift in terms of how it does business, but profits have stayed stable. Last year, it made a net profit of RM147.04 million, up from RM112.35 million in 2015. Its net profit for the nine months of 2017 has already exceeded last year’s figure, at RM152.43 million. Yusof explained the shift: “[Previously], the business was essentially global-markets focused — which is forex, rates, bonds and so forth. Our strategy over the last three to four years was to shift this focus so it would be more equally split between global markets and our global transaction banking business. “So now, that split is 50-50 and we’re well balanced. Our numbers aren’t necessarily volatile or dependent on where the markets are, and because of that split, it’s a more well-balanced approach,” he said. “The requirement for tenure around financing, for example, is much shorter and require a lot more help around cash management as opposed to straightforward loans. So, there’s been a big shift in the composition of revenue, and there’s also been a big shift in terms of how we recognise those revenues. And that’s why you get a situation where even though assets have come down, profits have remained stable and are in fact going up. That’s something which was planned over the last couple of years,” he added. Deutsche Bank’s increasing focus on the Apac region comes at a challenging time for the group. The last two years have been particularly tough as the bank was hit by a series of legal battles, including for past misconduct, that weighed on its financial performance and hurt its reputation. It also undertook hard-hitting, cost-cutting measures, including job cuts. Deutsche Bank reported a net loss of €1.4 billion last year compared with a net loss of €6.8 billion in 2015. Revenue fell 10% to €30 billion, the lowest in at least five years. This year, however, it has gone back to showing profit. For the first nine months of 2017, income before taxes was up 64% to €2.6 billion (RM12.62 billion), while net income more than tripled to €1.7 billion. In April, it raised €8 billion from its investors — including a group of Qatari investors and China’s HNA Group — through the sale of new shares, laying to rest any concerns about inadequate capital. Is the worst over for the group? “There’s always uncertainties, but from what I know — and I don’t know everything — I’m pretty convinced (it is). One thing is pretty clear, our costs for litigations are going down. And this is a good signal. We have a lot of good signals in 2017, and so we feel confident about 2018. But there’s no guarantee, of course, as with everything,” Steinmueller said. According to Steinmueller, Deutsche Bank has been busy winning back business. “Deutsche Bank has an unbelievably strong brand, and I can tell you, in the six months since we did the equity increase, I’ve not been asked about our performance. We are back to our old strengths from the financial side, and are winning business back. With the pipeline we have for the year ahead, I am confident that we will strengthen our position in Apac in 2018,” he said. “One thing we know is that the world economy is very stable at the moment, with around 3.5% growth … people are looking for opportunities, interest rates are slowly increasing, which is also very positive. We can expect two or three interest rate increases in the US. “At the same time, Asia is outperforming the world so I am convinced 2018 will be a good year,” he added. Below are excerpts of The Edge Financial Daily’s (TEFD) interview with Deutsche Bank’s CEO for the Asia-Pacific Werner Steinmueller and country manager for Malaysia Datuk Yusof Annuar Yaacob. TEFD: What is Deutsche Bank’s strategy to position itself in the region, considering the tough competition from other banks? Steinmueller: Yes, it’s very competitive out there [but] we are not competing in local markets. What we are competing on is cross-border business so [we target] MNCs, which is one of our sweet spots, and strong local corporates who are going offshore. And there’s an increasing number of Asian companies going international. Take some of the Indian companies, some of the big Chinese companies who are internationalising, and we’re helping these companies go more and more global on the commercial side and also on the investment banking. This is our clear strategy, using our expansive global network. We are in 15 countries in Asia at present, with deep product capability in each market, a footprint we are very proud of and many of our competitors envy. TEFD: What are some of Deutsche Bank’s concerns for the Malaysia business? 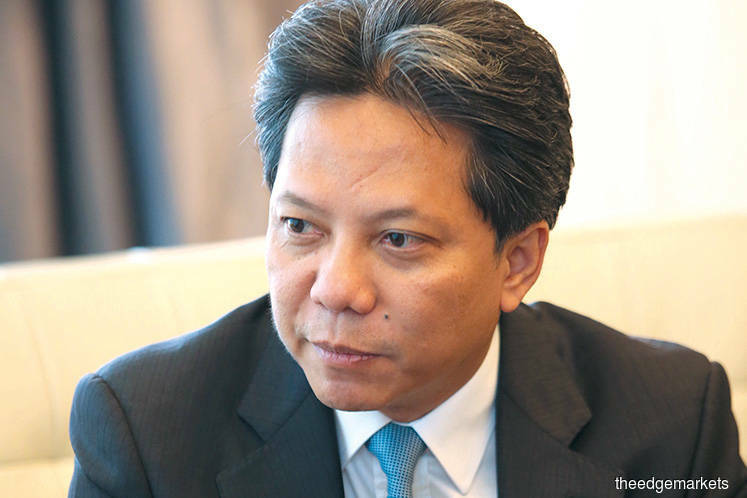 Yusof: For Malaysia, I don’t think there are any major concerns. Malaysia is in a good place, in that, so far, as an economy, it is very levered into the US. If you look at the Asean countries, at least, I think we have the biggest proportion of exports into the US. So, as the US grows and with some of the things that are happening in the US around the tax situation and so forth, hopefully Malaysia does [benefit from] that upswing as well. So, I think from our perspective, the linkages between our Deutsche Bank offices need to be strengthened even more because I see that our cross-border capabilities will be ramped up. So, my relationships with my colleagues in the US, for example, are something I need to strengthen because I know, at least, from conversations with clients in Malaysia, that there’s more investments coming through. The other thing is that there’s now a lot of Chinese participation now in the Malaysian economy. So, my relationship with my peers and colleagues in China are also going to be key as those are the two key markets where we see growth. TEFD: What are the biggest challenges you face as a global bank going into 2018? Steinmueller: This is nothing new — it is regulation, including Basel. It looks like Basel will come into effect in 2022 or later, so it’s far ahead. For us, it is also the complexity which comes from having such a large footprint in the region, which spans across diverse regulatory environments. I would love to have a more harmonised regulation. We have it partially in the eurozone and the Americas. All these things are impacting the business. So, really, when you ask about challenges, one is an evolving regulation landscape. And, the second challenge — though also an opportunity — is digitisation. It’s very important to have a clear strategy (on digitisation). A lot of things which were basically done by phone before are now automated. I’ll give you three examples: i) Foreign exchange is more and more automated dealing, with pre-agreed margins; ii) classical bond dealing is automated; and iii) cash equities are more and more automated. So, this is one of the developments that we see increasingly happening, and if you are not investing in these areas, it will mean losing sizeable investments and your competitive advantage. It also means compression in margins and there will be more consolidation, in my opinion. So things will change, and we are at the moment heading for a big change coming from digitisation, and not only in banking, but in many other industries. TEFD: Is there any one market in the region that’s going to play an even stronger role for Deutsche Bank? Steinmueller: All markets in the region are important. Each of the individual countries within Asean has its own nuance, but together they play a crucial role in our overall Asian strategy. There is also a certain dependency on the businesses with China and India, depending on the country, but this in the linkage is very important. The strong investment and commercial banking businesses we have in the developed markets in Japan and Australia are very important. We are leading investment banking houses in these markets. And of course, India and China as mentioned above, are key. All these markets are extremely important. And we have too much momentum in each to risk losing focus in any of them. Malaysia is becoming more and more important. It’s a growth area, and really has a key role in Asean. I think that it is the strengthening of the local companies and MNCs where we see a lot of opportunities. TEFD: Are there plans to ramp up headcount in Malaysia? Yusof: Our headcount has been fairly stable at around 220 people in Malaysia. That hasn’t grown nor has it come off a lot. I’m happy with where we are at today. Our revenue-per-employee number is very high and I think with the current people that we have onshore, we can do a lot more, so I don’t see any need for [a ramp-up]. Steinmueller: It’s more a question of investing in IT rather than headcount, so that the talented people we have on the platform already are better supported and able to do more. Malaysia is important and we’re investing in our IT infrastructure across the region. TEFD: Are fintechs friends or foes? Steinmueller: We shouldn’t be afraid of them (fintechs). We work together and cooperate with them. You need people to think outside of the box, so we feel that it is very important to collaborate with fintechs to do so. Banks will continue to exist in the future, if they are not afraid of investing and taking the challenges. By working with fintechs, and coming up with new ideas, you can be one of the winners in the long run.